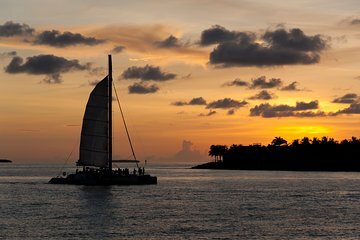 Obtenha uma perspectiva única sobre a beleza da "Garden Isle" a bordo de um catamarã de luxo neste cruzeiro ao pôr do sol em Kauai. Navegue em belas águas do Pacífico e entre no espírito da ilha enquanto ouve música havaiana ao vivo e desfruta de deliciosos aperitivos e coquetéis tropicais. Assista ao pôr do sol no horizonte e sinta o calor da brisa do mar durante esta inesquecível noite na ilha. Cerveja, vinho, coquetéis tropicais e outras bebidas incluídas! O litoral de Kauai é um cartão postal perfeito, com praias de areia dourada e falésias verdes dramáticas mergulhando nas águas abaixo. Mergulhe na beleza tropical da ilha em um relaxante cruzeiro de catamarã. Saia de Poipu a bordo de um luxuoso catamarã Gold Coast Yacht de 16,8 metros (16,8 metros) e depois navegue pela cênica costa sul em direção às praias de Maha'ulepu e Kipu Kai. Saboreie o espírito da ilha enquanto desfruta de coquetéis tropicais 'Sneaky Tiki', cerveja, vinho ou bebidas não-alcoólicas, e petisque aperitivos como frutas frescas, asas de frango, molho de espinafre e vegetais crus. Sinta a brisa quente do oceano em seu rosto e relaxe ao som da música tradicional havaiana, cortesia de talentosos músicos a bordo. Observe o cenário mudar conforme a ilha, o mar e o céu são banhados pelos tons brilhantes do sol poente. Após o seu relaxante cruzeiro de 2 horas, desembarque em Poipu para continuar sua noite encantada na ilha por conta própria. This is the second Captain Andy’s your we’ve done. Spectacular is the only way to describe the experience! Amazing crew and the views were absolutely breathtaking! The boat and sunset were good but the ocean was a little rough so that made it not as enjoyable. We have done other sunset cruises that were much better but you can,t predict the weather. The worst thing we did while on Hawaii - according to the description we arrived in time, but nobody was there - no sign, no nothing. At the time of the scheduled departure we finally spotted the boat on the horizont. An hour later we took off. We expected a sunset sailing cruise along the coast with some nice food and drinks and possibly music. We got a catamaran allright but it did not really sail. They used the motor most of the time, sailed about ten mimutes after severe trouble getting the automated! sail up at all 3 tries. We did not go along the coast but went a bit up, then down then up again just along the hotels of poipu. The food was bad cold chicken, sour pinaple, stale bread and the music. Well... He tried. Worst was the skipper - trying to tell jokes but stopping before he got to the funny part - every single time. Easily distracted? Bad memory? Just no fun stories? We will never know. All in all we were really happy to get off the boat. Overall I can't say I would recommend this tour. There are definitely better options for this price. I believe the biggest issue with the trip is that the cruise doesn't take you anywhere worthwhile. The trip just goes back and forth along the same part of the coast for the entire duration of the cruise. There's only so many times you can enjoy looking at the same coastal area. As well, the food was less than inspiring. The chicken wings were cooked before the cruise left, so by the time the food was served, they were rubbery and cool. Not as romantic as I thought. Needed more variety in cocktail and appetizers. What a great evening. Captain and crew were excellent and entertaining. Would do it again! !